As Mondays go, today wasn’t half bad. Work was busy but manageable; I felt recharged after the weekend. At some point today, I realized I had forgotten to thaw anything out for dinner. This either means we eat out (and spent twice as much as we would at the grocery store) or I come up with something quick and easy, stat. 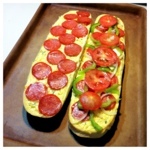 I immediately thought of my mom’s “pizza bread” (as she calls it) and dinner was as good as done. 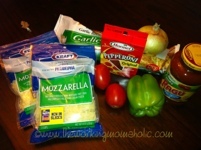 Toppings: onion, Roma tomato, bell pepper, black olives, etc. 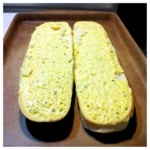 Set your frozen garlic bread out to thaw. Preheat your oven to 400 degrees. Slice your vegetable toppings while the oven preheats. I used tomatoes, bell peppers and onion (Black olives are great, too, but in my mad dash through the grocery store, I forgot them). 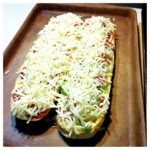 Take the thawed out garlic bread and place each half face up on a baking sheet. Layer your toppings beginning with the pepperoni and then adding your veggies. The last topping you put on your garlic bread pizza is the cheese. You may not need both packages, but we like it really cheesy so one package isn’t enough for both loaves. Once that’s done, place your pizza in the oven and bake at 400 degrees for 13-15 minutes or until edges are toasty and cheese is melted. I like ours crispy so I bake it the full 15 minutes. Remove from the oven and let cool for five minutes before slicing. While the pizza is cooling, heat the tomato sauce for dipping. Serve with tomato sauce and garnish with Parmesan cheese (optional). 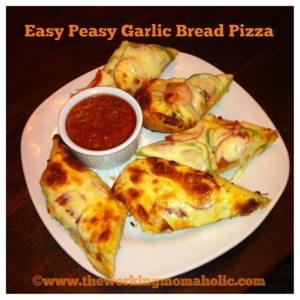 This entry was posted in Recipes & Meal ideas, Working Moms and tagged Easy dinner recipes, Easy recipes, Quick & Easy meals by The Working Momaholic. Bookmark the permalink. Haha, exactly! That’s why I use so much cheese–if my tot can see the veggie toppings, she’ll pick them off. Thanks for reading!